Northern Elements has unveiled a new smart mirror which the development team says revolutionary and takes the form of the Monolith, which is this week launched by a kick starter to raise the $50,000 required to go into production. Watch the demonstration video below to learn more about the Monolith smart mirror which is available to back with pledges starting from $600 and delivery expected to take place during March 2018 if the kickstart the campaign is successful. A simple idea, but complex to execute. 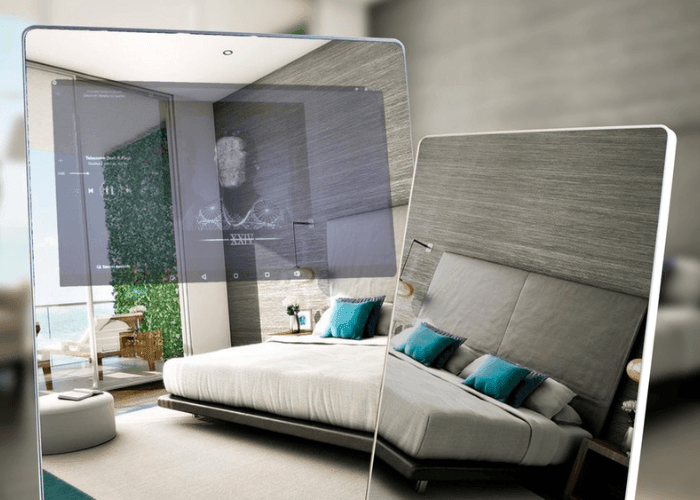 We found that creating your own smart mirror is difficult as deconstructed and standalone touchscreen surfaces arent readily commercially available. Try and simply lay mirrored film over a tablet and youll see your tablet’s touchscreen wont work anymore. So after being inspired by various DIY magic mirror posts across the web, we decided to make our own. After months of diligence, we secured a partnership with a top manufacturer, who took our drawing boards models and began iterating towards a final product. We design for anyone who takes pride in making their living space functional and unique. All of the current iterations of this idea feature a unit needing to be hanged on a wall. We’re urban focused and that means designing for those of us who live in apartments or otherwise dont own our space – making us less willing and able to fully express ourselves on our dwelling by drilling holes and hanging heavy items. Where mounting heavy items is off limits, we opted for a freestanding design for the Monolith to set firmly on the floor – no drilling required. You may have seen magic mirrors before on Reddit and Pinterest as Do-It-Yourself projects, but there aren’t any for commercial sale en masse. The DIY versions are a hodgepodge of refurbished parts and thus a basic understanding of entry level programming with the raspberry pi is required – its not a project for the faint of heart. The other software is great, but we opted for the reliability of a platform that has been more widely adopted, and has access to a larger breadth of applications, but also one open enough to allow the more adventurous to tinker should they want to.